Allstar Wrestling, FWA, 1PW, IPW:UK, LDN, NWE, Premier, RQW, wXw, 4FW, 4FW, WAW, BAWA, Dragon Gate, Osaka Pro, NGW, GBR, TNA, Plus many more. One thing that has to be said about “The Star Attraction” Mark Haskins is that he is without a doubt one of the best in the country. Not long after graduating from the FWA academy he would go on to team with Tommy Langford and pick up a victory over Jake McCluskey and Doug Williams. Mark Haskins would go on to wow many wrestling fans with encounters against people such as El Ligero, Nathan Cruz, Marty Scurll, Zack Sabre Jr and many more of the great names we see today. It was the phenomenal matches that Haskins became known for that got him booked with Dragon Gate where he tangled with The Young Bucks (Generation Me) and would go on to defeat Japanese names such as Don Fuji, Fumiyuki Hashimoto, and more. Haskins would go on to debut for another Japanese promotion, Osaka Pro Wrestling when he teamed with PAC (Adrian Neville) and defeat Cyber Kong and Fumiyuki Hashimoto. By 2011 Mark Haskins would be transcending British Wrestling, by getting signed to TNA wrestling, at the 2011 Destination X PPV, Mark Haskins defeated Doug Williams. 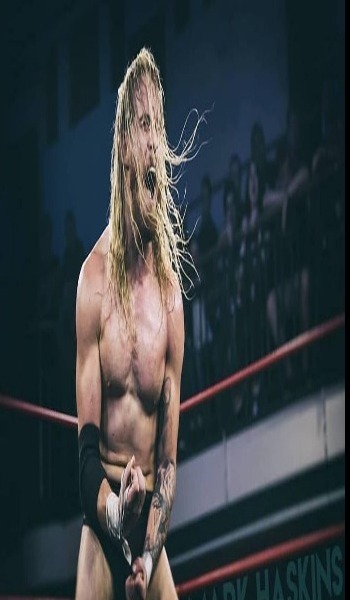 Later that year Mark Haskins would compete in an X-Division gauntlet match where he single handedly beat Alex Shelly and Robbie E.
While working with TNA Mark Haskins carried on performing in Great Britain and as of right now Haskins continues to impress fans and dominate foes.